When you meet a conservator to look at your object together, you will decide on the end goal for the treatment. The conservator will likely assemble the object temporarily to see how much of the original was recovered. Because it is much less time consuming to glue in a piece that already exists than to make a replacement, everyone will be glad that you found the shard that flew (or was batted by the pesky cat) into the farthest corner. The next step is deciding how far to restore the object. “Conservation treatment” might suggest fully restoring an artwork so that it looks unbroken, but that is only one of many possibilities. Some common considerations are: functionality of the repaired piece, desired appearance and cost of treatment. When making this decision, it may be difficult to imagine what different repair options would look like, especially on glass. This blog post shows the process of doing a full restoration. 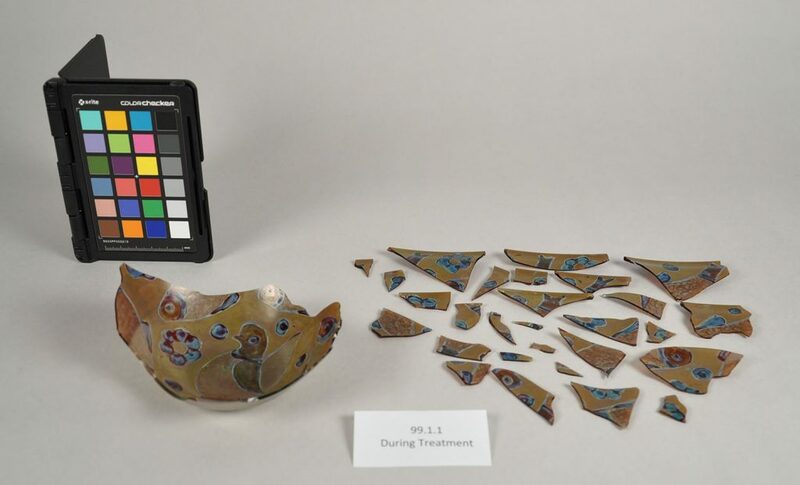 In this treatment, the conservator assembled the shards (figure 1), filled losses, and painted the fill material so that the repairs are seamless (figure 2). Figure 1: Fragments before assembly. 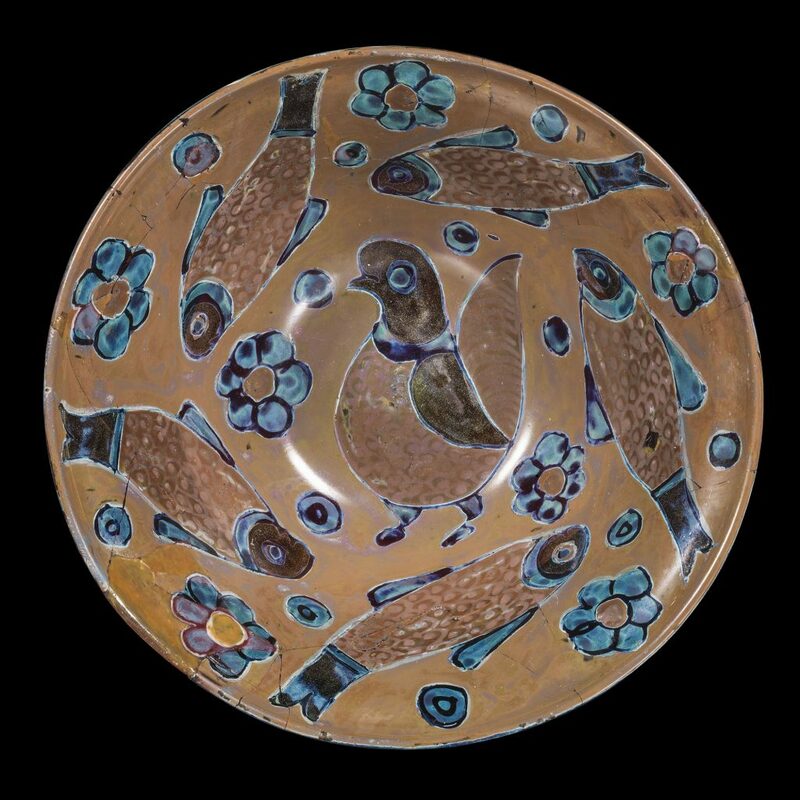 Figure 2: Bowl after treatment, probably Egypt, about 800-899. Gift of Lyuba and Ernesto Wolf. 99.1.1. 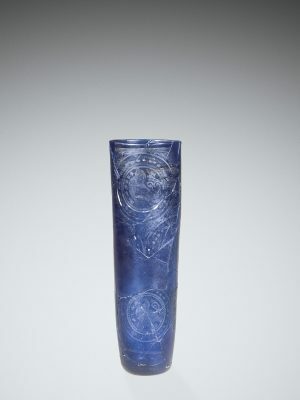 Beaker, Eastern Mediterranean, 1175-1225. Gift of Wilhelm Henrich. 67.1.19. In some cases, an object might then be filled so that it can be handled and displayed safely. 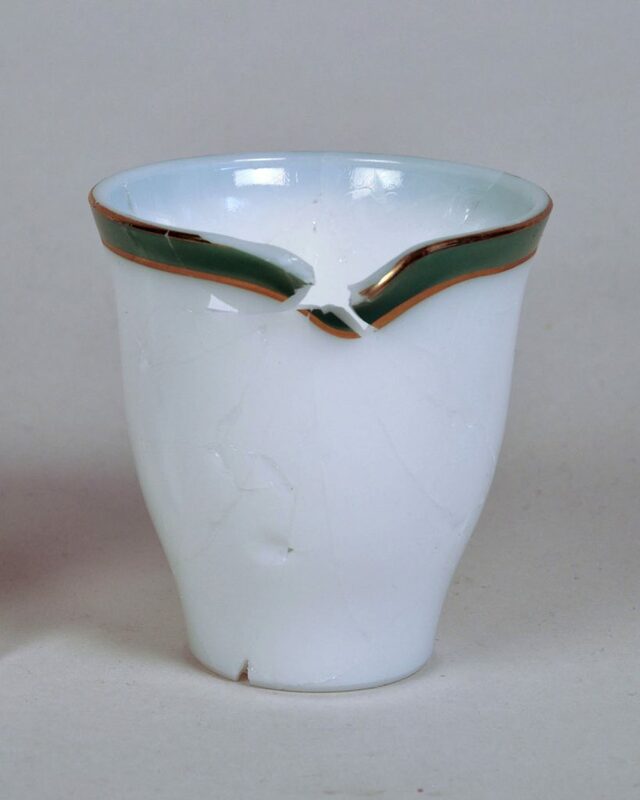 The conservator used colored fill material to stabilize this Islamic beaker. 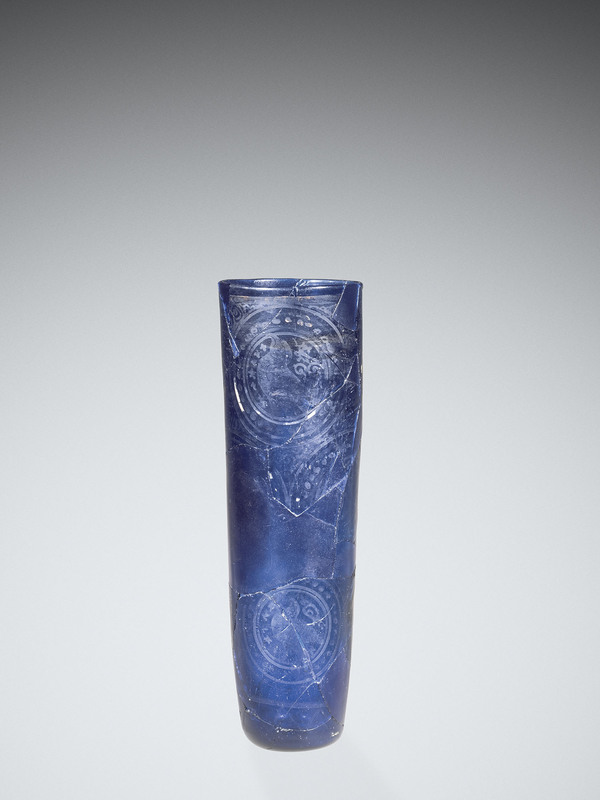 The fill material was colored to match the blue glass so that it does not call attention to itself at a glance. 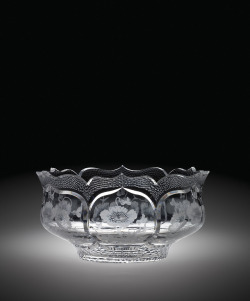 When looking closely, the fills are recognizable because they were not painted with decoration that matches the original glass. In other cases, an object might only be assembled. 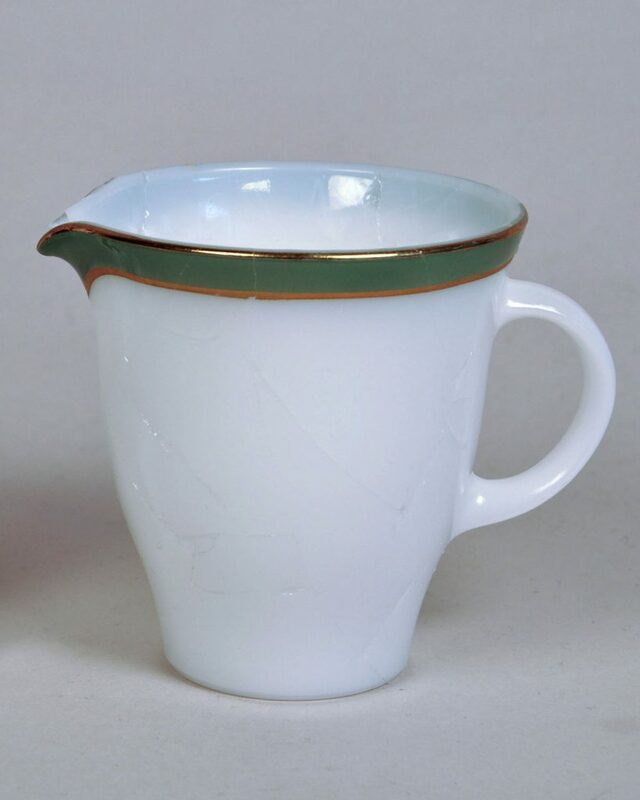 Because this Pyrex creamer was not going on display at the Museum and is stable without fills, the conservator made the decision to only assemble the existing pieces. Luckily, it can almost be turned to its “good side” to see the overall shape of the piece (and make the repair less obvious). 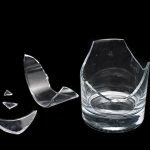 Sometimes, if a piece needs to be unbroken to be used, like a pitcher or drinking glass, it might be worth thinking about replacing the piece. Occasionally, the artist who made the piece might be willing to give advice on finding replacement parts. Pyrex creamer, Corning Glass Works, Charleroi, Pa. 2010.4.574 G.
Before deciding to hide all the evidence, it might also be interesting to think about what breaks and losses can and should tell about an object’s history, whether that includes damage that occurred during archaeological burial or a memorable game of indoor dodgeball. 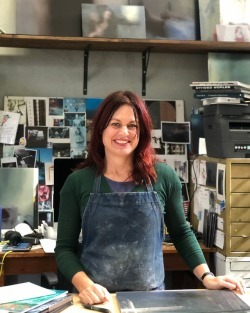 Lianne Uesato is the Assistant Conservator at The Corning Museum of Glass.